9148 Private Albert Bowles of the 2nd Battalion, the Devonshire Regiment. Son of Samuel and Sarah Ann Bowles. Born in Broadhembury in 1893. Died 1 July 1916 aged 23. Major Adrian Drewe of the 262nd Battery, the 47th Heavy Artillery Group, the Royal Artillery. Son of Julius and Frances Drewe of Castle Drogo, near Moretonhampstead. Born in 1891. Died 12 July 1917 aged 26. Mentioned in despatches. Castle Drogo is now a National Trust property which contains a room dedicated to the memory of their eldest son, Major Adrian Drewe. The Drewe family owned most of Broadhembury for 300 years and still have property interests in the village. Lt-Col Henry Bowden of the Royal Artillery. Husband of Caroline (née Downe). Born in Bridport, Dorset in 1856. Died 7 September 1916 aged 60 of illness in the UK. Buried in the churchyard at Broadhembury. 2nd Lieutenant Kenneth Lister James of the 4th Battalion, the Buffs; attached to the 6th Battalion. Son of the Rev. Charles James and his wife Clara of the Vicarage; brother of Basil (see below). Born in Axminster in the September Quarter of 1888. Died 3 May 1917 aged 28. 2nd Lieutenant Basil Lister James of the 4th Battalion, the Buffs. Son of the Rev. Charles James and his wife Clara of the Vicarage, Broadhembury; brother of Kenneth |(see above). Born in Broadhembury in 1896. Died 25 November 1916 aged 21. 8751 Private William Henry Jenkins of the Coldstream Guards. Son of John and Elizabeth Jenkins. Born in Broadhembury in 1894. Died 29 October 1914 aged 20. RMA10673 Gunner Francis Murch ("Frank") of the Royal Marine Artillery, attached to HMS Indefatigable. Son of Thomas and Elizabeth Murch of Kentisbeare. Born in Broadclyst in the March Quarter of 1886. Died 31 May 1916 aged 30. 28333 Private John Norman of the 8th Battalion, the Cheshire Regiment, formerly 253 of the Royal Garrison Artillery. Son of Alfred and Paulina Norman. Born in Broadhembury in 1882. Died 1 February 1917 aged 35. 11347 Private Harry Parsons of the 2nd Battalion, the Devonshire Regiment. Son of Harry and Lucy Parsons of Plymtree: Born in Tiverton in 1897. Died 9 May 1915 aged 18. 29998 Private Leonard Percival Passmore of the 8th Battalion, the Somerset Light Infantry. ; formerly 2086 of the Devonshire Regiment. Son of William and Sarah Passmore. Born in Heavitree in 1897. Died 4 October 1917 aged 20. T2/ 015136 Corporal Frederick Thomas Young of the Royal Army Service Corps. Son of Frederick John and Elizabeth Young; husband of Lucy Young. Born in Catherington, Hants in 1891. Died 27 June 1915 aged 24. Buried in the churchyard at Broadhembury. 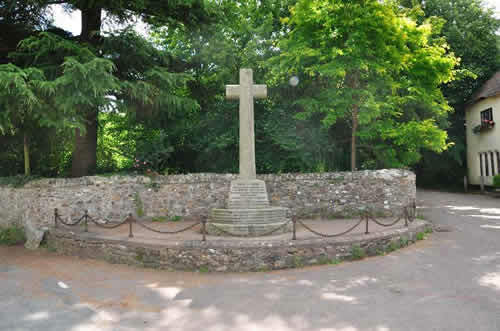 At the the same time as the memorial was dedicated on the 22 August 1921, the villagers added the following plaque to the cross commemorating Private Perry who had died in the Boer War. 5187 Private Edward Perry of the 2nd Battalion, the Devonshire Regiment. Son of edward and Eliza Perry. Born in Broadhembury in 1879. Killed in action at Venter's Spruit Laager 17 December 1899 aged 20. while serving in the Natal Field Force.